Individuals who possess Master of Arts in Teaching Degrees play essential roles in their communities as teaching aides, teachers, professors, principals, and superintendents. Through advanced skills in leadership, counseling, mathematics, the sciences, and languages, these professionals provide students of all ages with enhanced educations and support networks. As part of a rapidly growing sector, professionals in the field of teaching possess long-term stability in both their careers and salaries. Most accredited schools require applicants to possess at least a Bachelor’s Degree to qualify for entry into their Master of Arts in Teaching programs. Across the nation, there are many outstanding Master of Arts in Teaching Degree programs, and one of the best of them is Bard College MAT. Small class sizes and strong leadership values make the Bard College MAT program highly desirable to qualified candidates. Provided below is a detailed overview of this school and its exceptional teaching degree program. Accreditation: Bard College is accredited by both the U.S. Department of Education and the Commission on Higher Education of the Middle States Association of Colleges and Schools. Degree Name: Bard College offers a Master’s of Arts in Teaching Degree program to individuals who possess a Bachelor’s Degree, a minimum GPA of 3.0, records of academic achievement, and letters of reference. This program consists of 63 credit hours of study. Course Components: Course components of the Bard College MAT program are offered in 12-month and 24-month cycles. Those courses include: Identity, Culture, and the Classroom; Field Study in Natural History; Writing and Thinking About History; Topics in World Literature; Applied Mathematics; Classroom Learning Environments; and Learning and Teaching in the Disciplines. Tuition Cost: The tuition cost for the Bard College MAT Degree program is $624 per credit hour. This does not include book and fee costs. 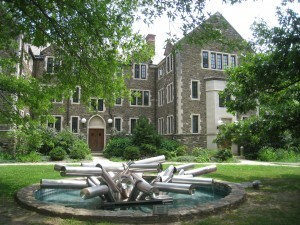 Financial Aid Opportunities: Bard College offers many financial aid opportunities, which include: the Bard Grant, Federal Stafford Loans, the New York State Tuition Assistance Program, the Carroll and Milton Petrie Fellowships, the Woodrow Wilson-Rockefeller Brothers Fund Fellowship for Aspiring Teachers of Color, and Bard College Rural Residency Program Scholarships. Interesting Facts: Bard College is ranked as one of the top schools in the nation by U.S. News and World Report. In addition, this college has been ranked as the seventh-most liberal college in the United States by the Princeton Review. Students who seek to obtain advanced educations should always verify the reputability and quality of the institution they wish to attend; after researching the Bard College MAT program, applicants will feel assured they will receive a quality education in the field of education.